The world’s most widely used weed killer, Roundup, causes honey bees to lose some of their beneficial bacteria and are more susceptible to infection and death from harmful bacteria. 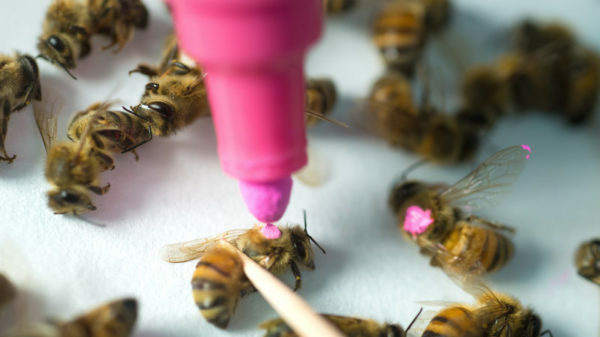 Honey bees are marked for study in the lab of Nancy Moran, professor of integrative biology at UT Austin. Exposure to glyphosate, the active ingredient in Roundup, causes some bees to beneficial bacteria in their guts, making them more susceptible to infection and death. AUSTIN, Texas — The world’s most widely used weed killer may also be indirectly killing bees. New research from The University of Texas at Austin shows that honey bees exposed to glyphosate, the active ingredient in Roundup, lose some of the beneficial bacteria in their guts and are more susceptible to infection and death from harmful bacteria.